Rafted All Over The World: These Guides + This Scenery = Best Whitewater Rafting Trip Ever! This whitewater rafting trip combined what they called a dude ranch with rafting. Dude Ranch: I expected a 'touristy' style ranch that could accommodate large crowds of wanna be cowboys and girls. Instead, I found the 'real deal': a working cattle ranch situated 75 miles from the nearest civilization, run by 4th generation real ranchers/cowboys. A staff of about 6 mostly related individuals ranging in age from low twenties to 81 take care of about (guessing here) 30 to maybe 50 people at time. Meals were served in a lodge about the size of the average small ski resort lodge. A fun, informational nature trail twisted around the hill behind the place, where we could sleep in covered wagons (a bit 'squishy' for two people to fit onto the beds if you're tall or wide..I'm neither but my head was at the headboard and foot was at the base) or you can sleep with more space inside the lodge, or outside on a deck under the stars with provided bedding. There are about 10 very large showers placed next to the men's and women's restrooms. Bring your own towel, soap, shampoo ect. The only downside I saw: I'm an animal fiend and I would've been happier had they not kept a few critters in cages for people to stare at. We're talking just snakes, a roof rat, chipmunk...just a few critters, but still....they did say they switch them out and release them and bring in new ones every few months. Next day, after sleeping in, we took a 6-minute long swooping chopper ride to the river.....that 6 minutes was better than a chopper ride I took over the canyon a few years back cuz we got to 'swoop', not just fly..only for 1-minute but it was a GREAT 1 minute swoop! Rafts: I've taken many rafting trips, but they've all been paddle style trips on small 8 person rafts. I feared that this huge 14 person plus guides raft wouldn't let me get wet 'n wild and 'feel' the river as one can on a small raft. Wrong, it was fabulous! You had a choice of 3 different places to sit on the raft: there was room for 9 people in the 'wet n wetter n wild n wilder' zone, then about 5 could sit in a 'splash' but mostly stay dry zone, and about 4 could sit in a dry 'lounge' area. Because of these options, your body didn't get tired from having to remain in the same posture for long periods of time as it does on small rafts. And the guides were THE BEST EVER!! A word about rain gear: The brochure doesn't emphasize enough that the main purpose of water proof jacket and pants is so that the 9 people sitting on the rafts wet and wild area remain at a comfy temp as they get constantly splashed with 50 degree water while traveling forward, which means about a 6 or so mph wind hitting your wet body. At least 6 of those 9 people get their entire lower legs dunked in and out of the water with each rapid. It was 100 degrees out and virtually all 9 of us wore long sleeved rain jackets under our life jackets and those of us not wearing rain pants were still on the chilly side when we were wet. Last: Those fabulous guides were great at giving us info on how to set up cots, tents, chairs, and we gals even got a very special class and piece of equipment I've never seen on a rafting trip before, we got Pee cups. Yes, to pee in, so that we weren't wading in the river at night to pee and so that we could wander off in the bushes, pee in the cup, then do the big toss of the contents into the river. A briliant idea on some ones part! 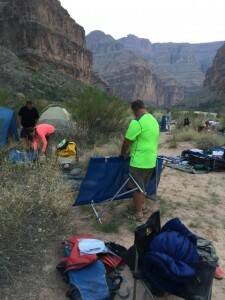 Two porta potties with the best views ever were set up each day in camp for solid waste. ..and on top all this, we saw 7 Big Horn Sheep...eat your hearts out, scientists! !